There is further chaos on the M1 today with three separate incidents and two lanes closures currently ongoing. 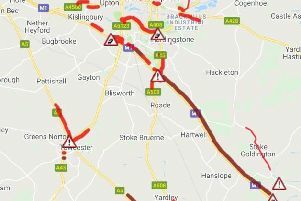 Severe delays on the southbound carriageway have been ongoing this morning between junction 15 for Northampton and Newport Pagnell Services with delays of up to 100 minutes at its peak. The details of this incident have not yet been confirmed. However delays are beginning to ease. In one of the latest incidents, one lane is closed due to a stalled vehicle on the northbound stretch between MK junction 14 and junction 15 Northampton. In a separate incident, another lane is closed on the southbound stretch between junction 15 Northampton and junction 14 for MK. There are long delays and queuing traffic for six miles due to a stalled truck. Travel time is currently 30 minutes with one lane closed to await recovery of the vehicle.